Boston Congregationalist ministers Charles Chauncy (1705-1787) and Jonathan Mayhew (1720-1766) were significant political as well as religious leaders in colonial and revolutionary New England. Scholars have often stressed their influence on major shifts in New England theology, and have also portrayed Mayhew as an influential preacher, whose works helped shape American revolutionary ideology, and Chauncy as an active leader of the patriot cause. Through a deeply contextualised re-examination of the two ministers as 'men of their times', Oakes offers a fresh, comparative interpretation of how their religious and political views changed and interacted over decades. The result is a thoroughly revised reading of Chauncy's and Mayhew's most innovative ideas. 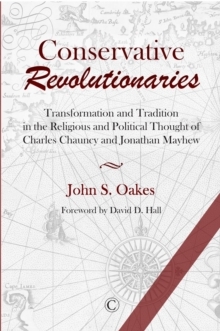 Conservative Revolutionaries unearths strongly traditionalist elements in their belief systems, focussing on their shared commitment to a dissenting worldview based on the ideals of their Protestant New England and British heritage. Oakes concludes with a provocative exploration of how their shifting theological and political positions may have helped redefine prevailing notions of human identity, capability, and destiny.